On a frigid morning at a bus stop in Muldoon, Anchorage transit planner Bart Rudolph traced a blue line on a map. The blue line was Route 13. It snakes to the city's major hospitals and the University of Alaska Anchorage campus and swings past the Anchorage Senior Center before shooting north to downtown. Rudolph described it as a "catch-all route." With stops almost everywhere and a route that takes nearly an hour to traverse 13 miles — that's an understatement. "If you were designing a route that wanted to hit everyone without having them walk very far, this is the route," Rudolph said. That sums up Anchorage's bus network: Try to reach a little bit of everybody, and take time to do it. But a bold change appears to be coming. Faced with declining ridership and cuts driven by constricting budgets, and inspired by transit officials in other cities, like Houston, Texas, Anchorage transit officials started surveying the public in April about ways to shake up the system. Now two redesign concepts are circulating created by Portland-based consultant Jarrett Walker & Associates. In general, some passengers would have to travel further from home to get to a bus stop. Fewer people will have easy access to any bus service, particularly in South Anchorage. The city's lightly used rush-hour route to Chugiak-Eagle River will be scrapped entirely, leaving only Eagle River Connect, an AnchorRides van-type service. But, in the densest parts of the city, buses will arrive much more quickly — every 15 or 30 minutes, instead of by the hour. And, the consultant predicts, there will be more people on the bus. Both redesign proposals mark dramatic departures from the status quo. And it's all happening somewhat quickly. Officials expect to pick a preferred concept by the end of January, and hope the change will take effect Aug. 1. On a recent Monday, at 10:15 a.m., the 13 bus pulled away from the intersection of Muldoon and DeBarr roads. The ride was quiet. In 45 minutes between Muldoon and Fairview, three people boarded. All of them got off at hospitals, the Alaska Native Medical Center and Providence Alaska Medical Center. Over a few stops between the hospitals and downtown, the bus picked up no one. Near the intersection of Northern Lights Boulevard and Boniface Drive, about 15 minutes into the ride, a man in a baseball cap and purple winter coat with a fur ruff boarded. Then the bus turned down a residential street off Boniface. It bounced over speed bumps. Under either of the two redesign proposals, the use of neighborhood streets, cul-de-sacs and parking lots would become much rarer. Buses would mostly stick to major roads. Route 13 hits critical areas, like the hospitals and the universities, Rudolph said. But it's one of the most circuitous and least-used routes in the city, he said. The route averages about 19 riders for every hour the bus is in service. Circuitous routes need fewer transfers. Under the redesign, the People Mover system would require more transfers, but riders won't have to go to the city's three transit centers — Muldoon, Dimond Center and downtown — to do it, Rudolph said. Anchorage's current bus network dates back to 2002, oriented around the transit centers. Routes change slightly from year to year, but the design of the system hasn't seen a major shake-up since the day it began. Over the past decade, budget cuts have chipped away at service, Rudolph said. The proposed redesign is about "using the exact same budget we have today, but using it differently and in a more efficient manner," he said. City officials say they can't afford more buses and drivers for the system. 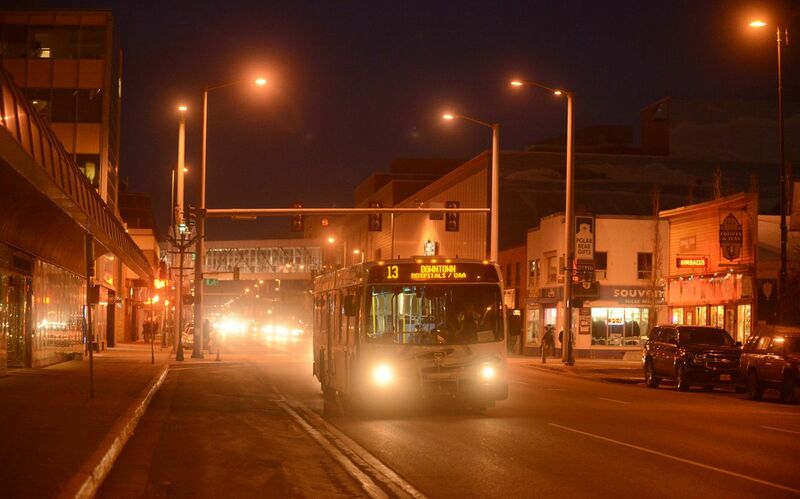 Changing the bus network could have implications for the way Anchorage grows. Take Northern Lights Boulevard. That stretch of road has been designated by city planners as prime for redevelopment. If buses came every 15 minutes along the roadway instead of every hour, businesses and developers could see an opportunity in recruiting employees or in saving money on parking, said city planner Tom Davis, who has been working on an update to the city's land-use map in consultation with transit officials. City planner Thede Tobish said developers see Anchorage's bus network, marked mostly by routes with hourly and limited weekend service, as a negative. "A lot of Lower 48 developers that look at Anchorage, or just in general, tell us they won't consider higher density if there's no bus route," Tobish said. On Emmanuel Avenue, off Boniface, two more people boarded. One was an older man using a walker. The way the system is designed now, people rarely have to walk further than a quarter mile to get to a bus stop. That distance could double under the current proposals. Anchorage is notorious for narrow sidewalks and slow to nonexistent walkway snow removal. But at the "Transit Talks" public workshops this summer, people overwhelmingly favored walking farther to avoid waiting for the bus, Rudolph said. He said transit officials are participating in long-term plans to make Anchorage more friendly to pedestrians. The city's Americans With Disabilities Commission will be offering recommendations to People Mover in December, said David Levy, who staffs the commission and works for the city health department. A lot of bus stops don't have benches. Some have been strategically removed in recent years based on recommendations from the Anchorage Police Department after complaints about people loitering at bus stops all day and sleeping on the benches. But with more buses arriving every 15 minutes, people won't have to wait as long after their walk, Rudolph said. Driving into Fairview, a few people boarded the 13 at a low-income housing complex at the bottom of a hill on Medfra Street. No one boarded at the Anchorage Senior Activity Center on East 19th Avenue. The nearest bus stop under the "100 percent" design would be up the icy hill for seniors and other neighborhood residents. But they may not have to walk it. For those who qualify, door-to-door paratransit service, with AnchorRides, isn't going to be affected, Rudolph said. At the downtown transit center recently, signs set up in the lobby showed People Mover's redesign proposals. The signs drew a small but steady stream of curious passersby and dedicated bus riders. Beverly Moore, 85, said she's ridden the bus four decades and regularly attends transit meetings. She was wearing a long purple jacket and had a gray bag that said "Peace." She was adamantly against the more drastic proposal, known as the "100 percent" plan, to almost entirely cut bus service to South Anchorage. She had appointments on that side of town. She said she could live with the less dramatic proposal, known as the "80 percent" plan. But instead of an overhaul in favor of frequent service, people should just learn the bus schedule, she said. Another bus rider, Matthew Scott, 37, had a copy of the consultant's report in his bag. He uses the bus to get to his job at Pacific Alaska Wholesale in South Anchorage. He said he had a lot of concerns about the proposals. "I know the system is not that great when it comes to frequency compared to other parts of the country. I know most of the routes are hourly and it's difficult for people to use them," Scott said. "On the other hand, there's broad enough coverage, if this is a system you need to use, you have a choice for where you can reside in the city." Scott pointed to a chart showing that between 30,000 and 85,000 fewer people would have access to any bus service under the two options, though a large number of people would have access to frequent service for the first time. Scott wondered why the city was making such radical changes so fast. "Why not step it up over time?" Scott asked. He said he also was concerned about so much authority being concentrated in Mayor Ethan Berkowitz in stamping final approval on the change. The Anchorage Assembly is not scheduled to hold a hearing or a vote on the redesign. In an interview, Berkowitz countered that the redesign plans grew entirely out of public feedback. But Berkowitz, who campaigned on improving the city's public transit system, supports a big change. He said the city has changed its bus-use patterns substantially in the past two decades. "The notion of being static … just doesn't make sense to me," Berkowitz said. Rudolph said the city wants to build a "backbone" of frequent, useful service that can expand over time, rather than sticking to a model that tries to get as close as possible to everyone's front door. The two preferred redesign concepts were released in early November. The first round of public meetings and open houses wrapped up Nov. 19. Feedback has largely been positive so far, Rudolph said. "Most people are finding they can agree with at least one of the concepts," Rudolph said. A second, final series of public meetings with members of the city's Public Transit Advisory Board will start Dec. 5. Advisory board chair, Jed Smith, said he supports changing the system. But he also plans listen to testimony with an open mind. "What I expect will happen, we're going to hear a lot of pushback from people who are going to say, 'I have to walk further to my bus stop,'" Smith said. "I think that will be hard to hear, and hard to listen to." He said he also hopes in making criticisms, people will offer ways to make the system work better for everyone.